By combining an FDA-approved cancer immunotherapy with an emerging tumor-roasting nanotechnology, Duke University researchers improved the efficacy of both therapies in a proof-of-concept study using mice. The potent combination also attacked satellite tumors and distant cancerous cells, completely curing two mice and effectively vaccinating one against the disease. The results appeared online in Scientific Reports on August 17. "The ideal cancer treatment is non-invasive, safe and uses multiple approaches," said Tuan Vo-Dinh, the R. Eugene and Susie E. Goodson Professor of Biomedical Engineering, professor of chemistry, and director of the Fitzpatrick Institute for Photonics at Duke University. "We also aim at activating the patient's own immune system to eradicate residual metastatic tumors. If we can create a long-term anticancer immunity, then we'd truly have a cure." The new approach relies on a "photothermal immunotherapy" technology developed by an interdisciplinary group of Duke researchers that uses lasers and gold nanostars to heat up and destroy tumors in combination with an immunotherapeutic drug. This photothermal therapy hinges on the widely demonstrated fact that nanoparticles accumulate preferentially within a tumor due to its leaky vasculature. While several researchers around the world are pursuing such techniques using nanoparticles, Vo-Dinh has pioneered the development of a unique type of nanoparticles called gold nanostars, which have the advantage of geometry. Because gold nanostars have multiple sharp spikes, they are able to capture the laser's energy more efficiently. This allows them work with less exposure, making them more effective deeper within a tissue. "The nanostar spikes work like lightning rods, concentrating the electromagnetic energy at their tips," said Vo-Dinh. 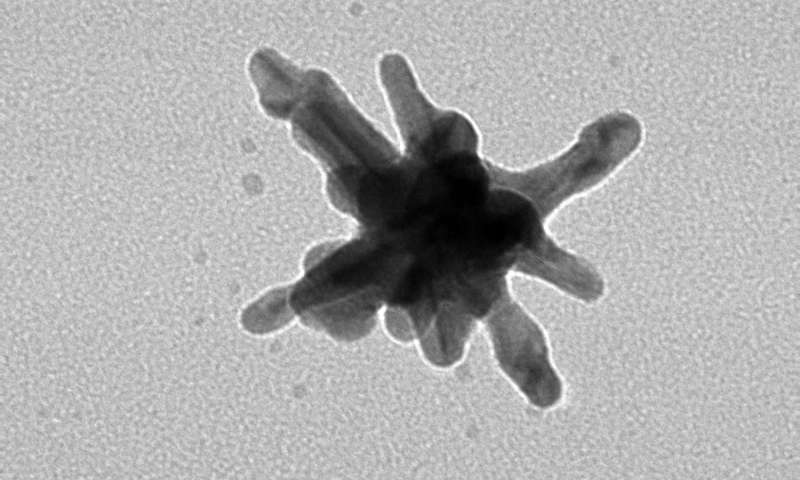 "We've experimented with these gold nanostars to treat tumors before, but we wanted to know if we could also treat tumors we didn't even know were there or tumors that have spread throughout the body." To attack distant cancerous cells outside of the treatment site, Vo-Dinh teamed up with colleagues Brant Inman and Greg Palmer in the Departments of Surgery and Radiation Oncology at Duke University Medical Center, and Paolo Maccarini of Duke Biomedical Engineering. They combined this gold nanostar therapy with a cancer immunotherapy recently cleared by the FDA and in clinical use. Normally, the body's immune system protects against the growth of cancerous cells. Many tumors, however, overproduce a molecule called PD-L1, which effectively disables T cells, the immune system's main soldiers. Several pharmaceuticals are being developed to attempt to block the action of PD-L1, allowing the immune system to destroy the cancerous cells. Inman has been active in the early development and current clinical use of these drugs—which were used in this study—to treat bladder cancer. In the experiment, the Duke researchers injected bladder cancer cells into both hind legs of a group of mice. After waiting for the tumors to grow, the researchers began trying different types of treatments—but only on one of the legs. The group treated with both the immunotherapy and the gold nanostar phototherapy fared much better, with two of the five mice surviving more than 55 days. "When a tumor dies, it releases particles that trigger the immune system to attack the remnants," said Vo-Dinh. "By destroying the primary tumor, we activated the immune system against the remaining cancerous cells, and the immunotherapy prevented them from hiding." The combined treatment worked so well that, in a bit of a surprise, one mouse is still alive nearly a year out with zero recurrence of the cancer. Even a month later, when the researchers injected more cancerous cells, the mouse's immune system attacked and destroyed them without a problem indicating a vaccine effect in the cured mouse. "This is our goal—our dream," said Vo-Dinh. While researchers conducted this proof-of-concept experiment with a small number of mice, the results are encouraging. The Duke researchers now plan to follow up with larger cohorts and to work with other clinical researchers to test the treatment on mouse models of brain, breast and lung cancer.